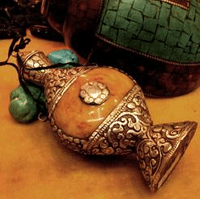 Handmade Tibetan Arts Big Mila Snuffle Bottle. It was handmade in Tibet from silver and mila. Height:12cm, weight: 160g.